PORET | What is Permaculture? You are here: What is Permaculture? Permaculture is a design approach that respects the balance of nature, while producing enough food to support the community. It can create reliable, sustainable systems for all animal and plant communities at a given location. Permaculture was developed 30 years ago by Bill Mollison and David Holmgren in Tasmania. This method has spread across the world ever since, and its application has been essential to creating truly sustainable ways of living. Permaculture teaches fundamental concepts that are applicable to almost all aspects of life, and that create sustainable and future-proof systems. One of the main pillars of permaculture is subsistence economy - in the sense of a self-sufficiency which enables farmers to produce their own food, creating and using renewable resources, and caring for the environment. In this way, these economies form the basis for healthy families and communities. Permaculture is one of the most effective methods to empower people in the developing countries to take control of their own life in a sustainable way. And after some start help, it creates systems that will function well without external support. Detailed information about the principles and ethics of permaculture, both theoretical and practical. Overview of the ethics and principles of permaculture as developed by David Holmgren. Holmgren recently evolved the original principles to make them applicable to any aspect of human interaction. 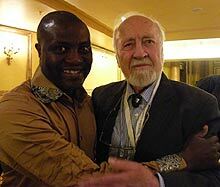 article by Bill Mollison in which he discusses how permaculture is a design science. Find out how you can support the project. Julious Piti will be holding a workshop at the 11th European Permaculture Convergence in Kassel (Germany). Santa Fe (USA): Julious Piti will hold a lecture, "From Africa with Love", on sustainability and permaculture in Africa. Explore other projects in the region to see the positive impact of permaculture.